Paris Saint-Germain celebrated their first Ligue 1 title in nearly two decades with a parade through the city. It concluded with the customary tear gas. 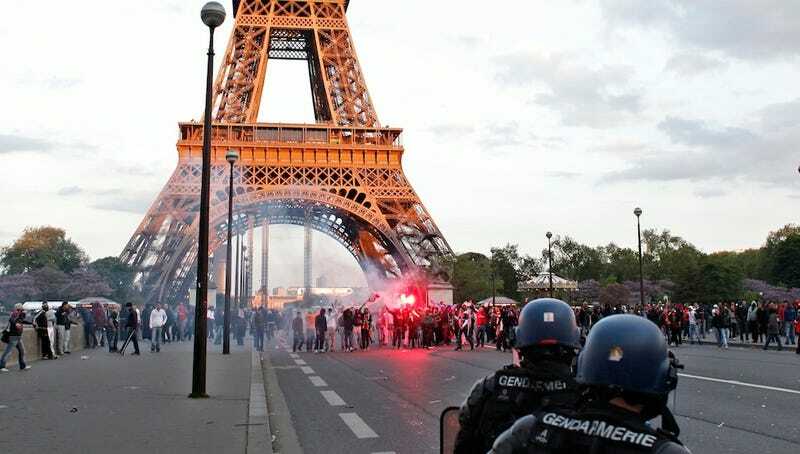 The Carlo Ancelotti-coached, big-budget Ligue 1 champions rode tour buses through Paris, carrying the trophy to what was supposed to be a celebration at the Trocadero. The team was an hour late, and the crowd, numbering in the tens of thousands, had grown restless by the time they arrived. Fans climbed a scaffolding and nearby rooftops, security escorted the players away before their scheduled speeches, and things turned ugly. There were brief clashes with police, and broken shop windows, with only minor injuries reported. A team riverboat cruise was canceled.